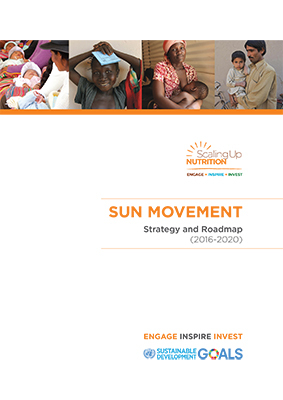 The Scaling Up Nutrition (SUN) Movement Strategy and Roadmap (2016-2020) is the product of a consultative process that spanned SUN Countries, multiple United Nations (UN) and donor agencies, along with hundreds of international and national non-government organisations and businesses. 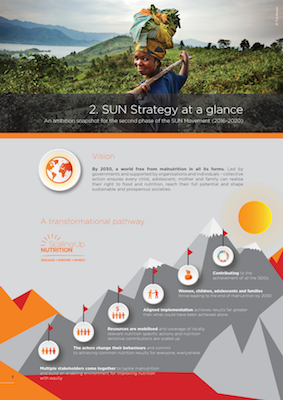 It outlines the SUN Movement’s second phase and is focused on translating momentum into results for people who suffer due to malnutrition everywhere. It presents a practical vision of how we can all work together, toward our vision of a world without malnutrition by 2030.